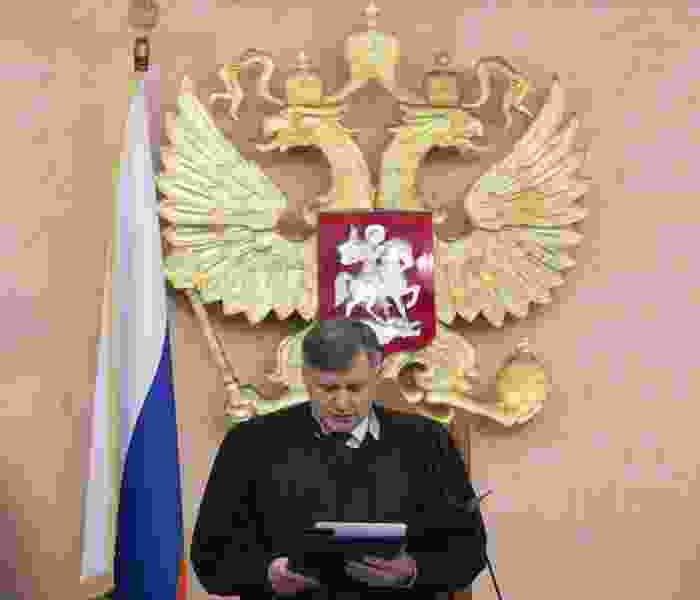 (AP Photo/Ivan Sekretarev) Russia's Supreme Court Judge Yuri Ivanenko reads the decision in a courtroom in Moscow, Russia, on Thursday, April 20, 2017. Russia's Supreme Court has banned the Jehovah's Witnesses from operating in the country, accepting a request from the justice ministry that the religious organization be considered an extremist group, ordering closure of the group's Russia headquarters and its 395 local chapters, as well as the seizure of its property. The U.S. Commission on International Religious Freedom cited more than two dozen countries as main contributors to an “ongoing downward trend” in religious liberty worldwide and called on the Trump administration to prioritize the release of religious prisoners and assist in resettling refugees fleeing persecution. “Sadly, religious freedom conditions deteriorated in many countries in 2017, often due to increasing authoritarianism or under the guise of countering terrorism,” USCIRF Chairman Daniel Mark said as the independent watchdog issued its 2018 report Wednesday. The report noted the range of severe abuses in 28 countries, from what the U.S. and U.N. have labeled “ethnic cleansing” of Rohingya Muslims in Myanmar (also known as Burma) to persecution of Tibetan Buddhists, Uighur Muslims and Falun Gong practitioners in China. It cited the Islamic State group’s continuing “genocidal campaign” against Christians, Yazidis and Shiite Muslims; Russia’s harsh treatment of Jehovah’s Witnesses, Muslims and Scientologists; and “the continued unjust detention” of U.S. pastor Andrew Brunson in Turkey. As it did in 2017, the commission asks the State Department to redesignate 10 nations as “countries of particular concern,” or CPCs, for egregious religious freedom violations: Burma, China, Eritrea, Iran, North Korea, Saudi Arabia, Sudan, Tajikistan, Turkmenistan and Uzbekistan. It also reiterated its request that the department add six countries to that list: Central African Republic, Nigeria, Pakistan, Russia, Syria and Vietnam. Mark told reporters in a conference call that the repeated requests should not be viewed as a “status quo move” but rather the result of continuing monitoring of each country. He pointed to the example of Russia, which was added to the list of suggested CPCs last year. “All the news has only confirmed that move and suggested that the State Department should take a very serious look, for example, at Russia and the others as well,” said Mark, an assistant professor of political science at Villanova University. In 2017, for instance, Russia banned Jehovah’s Witnesses, labeling them “extremist” and ordering the state to seize their properties. In addition, The Church of Jesus Christ of Latter-day Saints began calling its missionaries in Russia “volunteers” in 2016 in response to Moscow’s anti-terrorism law, which restricts religious work to houses of worship and other faith-related sites. Earlier this month, though, LDS Church President Russell M. Nelson announced plans to build a Mormon temple in a yet-to-be-determined major Russian city. The commission also recommended the State Department designate as “entities of particular concern” organizations its members consider severe religious freedom violators: the so-called Islamic State of Iraq and Syria, or ISIS; the Taliban in Afghanistan; and al-Shabab in Somalia. Commissioners traveled to a dozen countries in 2017 and early 2018 to assess religious freedom conditions, prioritizing religious prisoners of conscience, blasphemy laws and the connections between women’s equality and freedom of belief. Two commission members visited Brunson in late 2017, becoming the first Americans to visit him outside family and consular staff, Mark said. In their report, commissioners requested that the Trump administration provide sufficient funding for the office of the international religious freedom ambassador, a post recently filled by former Sen. Sam Brownback. They also called for prioritizing the release of people “imprisoned for their religious beliefs, activity, identity, or religious freedom advocacy” and the resettlement of refugees fleeing religious persecution. The report noted the commission’s ongoing concerns about the administration’s expansion of “expedited removal” procedures in which Department of Homeland Security officials deport some noncitizens. In addition to the CPCs, the report also cited 12 “Tier 2” countries that are considered to be less problematic but still violators of religious freedom: Afghanistan, Azerbaijan, Bahrain, Cuba, Egypt, India, Indonesia, Iraq, Kazakhstan, Laos, Malaysia and Turkey.